I've mentioned a few times on here that I have severe anxiety issues. I've dealt with anxiety for a few years now but it wasn't until my junior year of college, when I went to see the school counseling center, that I realized that what I was dealing with was anxiety. It wasn't as bad when I was at school, mostly because I was always very busy. My campus organizations, the sorority, classes, and my social life kept me very busy. When graduation came a knocking and the real world was right behind it, my anxiety started acting up again. The summer was really rough. I was having anxiety attacks every day, the smallest things sent me into a frenzy, and I couldn't identify my emotions most of the time. Anxiety is the worst feeling in the world. It feels like you can't breathe, like you can't make a decision, like you can't even smile. My anxiety attacks consist of a lot of crying, hyperventilating and over-thinking. I over-think everything and pretty much always jump to conclusions, no matter the situation. The situation in my head is always worse than the reality. Sometimes, if I'm not anxious about a situation, I start to become anxious with how un-anxious I am. How insane is that? I hit a low point in July and it was pretty much rock bottom for me so I knew I needed to do something. That's when I made an appointment with a therapist, but it wasn't until September so I had another month and a half of trying to wade the waters alone. I convinced myself to get a lot better after my rock bottom. I just started to think more clearly and convince myself that my demons were in my head and that no situation is as bad as it seems. I got my first job and was in a routine, it was just much better. After I started seeing the therapist, my head became even clearer. Having someplace to go every week and just talk about problems (or just talk in general) was helpful. I got the tools to help coach me through an anxiety attack, recognized why I was so anxious, and learned that I needed to let go of my control issues. (Side note: I'm a major control freak, if that wasn't obvious already). 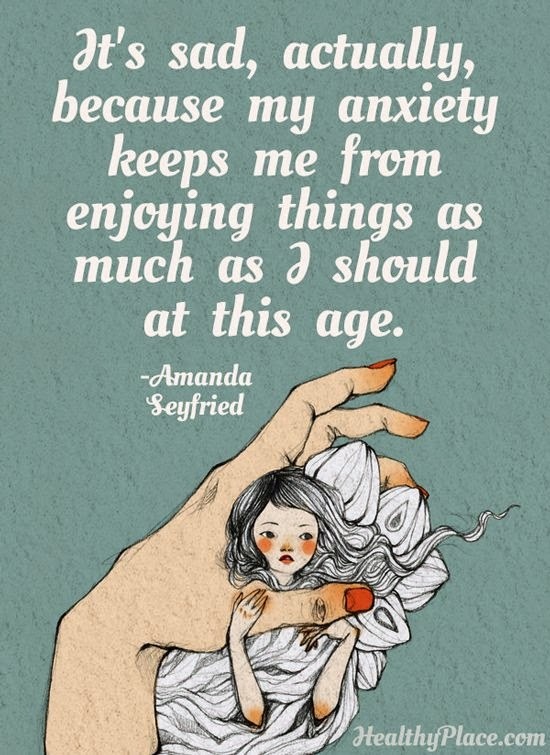 I realized that my anxiety was controlling my life and it doesn't have too. It was really inhibiting me from doing things I wanted to do and I'd be lying if I said that doesn't still happen because it does. I can, however, say my anxiety attacks are far less and I have a clearer view of life. Sometimes I still get down, more recently I've been very scatter brained, stressed, and overwhelmed, for no good reason. I've been working on it and something has been helping me. I'm a little too young and not really a great candidate for prescription medication for my anxiety, but sometimes there are times when I can't handle it... when I can't stop crying and I can't breathe and I just can't calm down and my head won't let my body stop reacting. Sometimes, the physical reactions to anxiety is what would get me; I would know in my head that everything was okay but my body couldn't get the message. It's sickening and I knew there had to be something that could immediately help. Well, my browsing in the drugstore one day, helped immensely. I saw this little bottle on the bottom shelf near the sleep aids and it caught my eye. 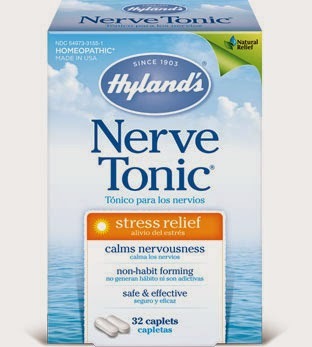 Hyland's Nerve Tonic is a natural stress reliever. It says that it helps to relieve the symptoms of stress, nervousness, mental anxiousness, and irritability. That pretty much is me on a daily basis. I grabbed the bottl, which is $10 for 32 caplets and continued to browse the store. I quickly Googled reviews of this nerve tonic and everything was 100% positive. I didn't see one single negative review. One of the features of this is that it is non habit forming so I figured it was worth a shot. Later that day (this was about a month and a half ago), I had a major anxiety attack (all in my head), so I took the Nerve Tonic and OH MY GOD. I was instantly calm... it was like everything became clear and I was able to think for myself. My anxiety wasn't controlling me anymore. It really took away the physical symptoms; my heart stopped racing, my crying stopped, and I stopped shaking. I was amazed at how quickly this was able to relieve my anxiety. I knew right then and there that this was going to be a major help. The directions say that you should take it every three hours but I think that's way too excessive so I take only as needed. If I could feel myself getting worked up, I'll take two caplets and I feel the relief in order to move on with my day. I know some people are very against medication, especially when it comes to mental health, but I am not one of those people so that's why I'm writing this post. I've been wanting to talk about my anxiety for a while, and once I found something that really, really helped me I knew I needed to share. I'm always very wary of taking new OTC medication that I have never heard of so I wanted to share my experience, in case any of you suffer from anxiety and need something to take away those physical symptoms. If I described anything in this post that sounds like you, or something you suffer with, I hope this helped. Read the reviews of the Nerve Tonic yourself and decide if you'd like to try it. It's something that has greatly helped me and I'm very happy I found it. It hasn't erased my anxiety but it surely has tamed it. Do you have any advice for me on how to deal with anxiety? Tell me in the comments below!